Super Mario throws his cap to reach for the moon in his new adventure, “cap”-turing us once again. While Odyssey is not as revolutionary as Mario 64, it evolves the franchise and is the best 3D Mario platformer in quite some time. It’s difficult not to have a great big smile while playing this game. It is a pure delight to play with brilliant level designs, secrets galore, and a surprising new gameplay twist that is super cool. 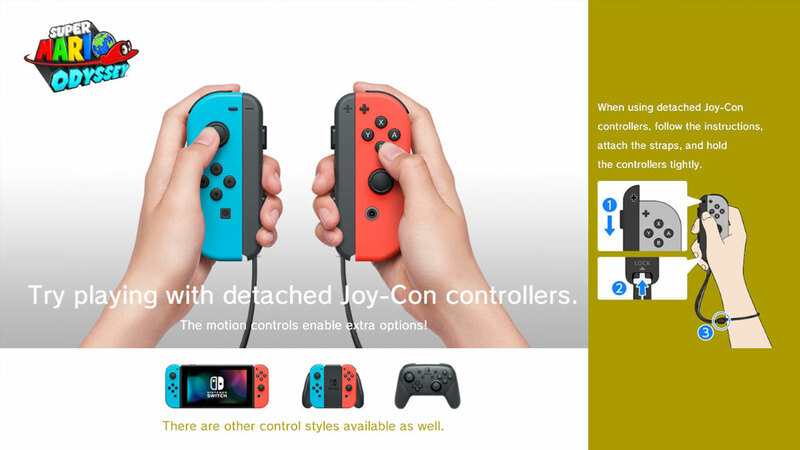 It’s a must-own for any Switch owner. Just about any child that understands how to use a controller can play Super Mario Odyssey. 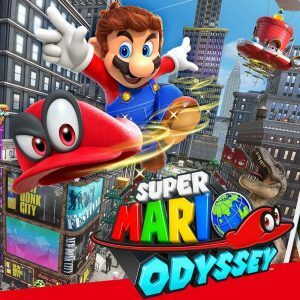 Although Super Mario Odyssey is rated E10+, we think that game is a great game for players of all ages. Most games are not designed for both kids and experienced players but Super Mario Odyssey has been designed with every player in mind. Luckily, the game features an assist mode for kids, which will help direct kids where to go. Just about any child that understands how to use a controller can play Super Mario Odyssey. The game stars Nintendo most recognized mascot, Super Mario, who has been starring in some of the most iconic video games for over 30 years. Some parents might be disappointed that the story hasn’t changed much and is still shallow. It’s still the same old tired damsel in distress story. This time around Mario has to stop Bowser from marrying Princess Peach. In the game, players must find Super Moons to power up Mario’s spaceship. 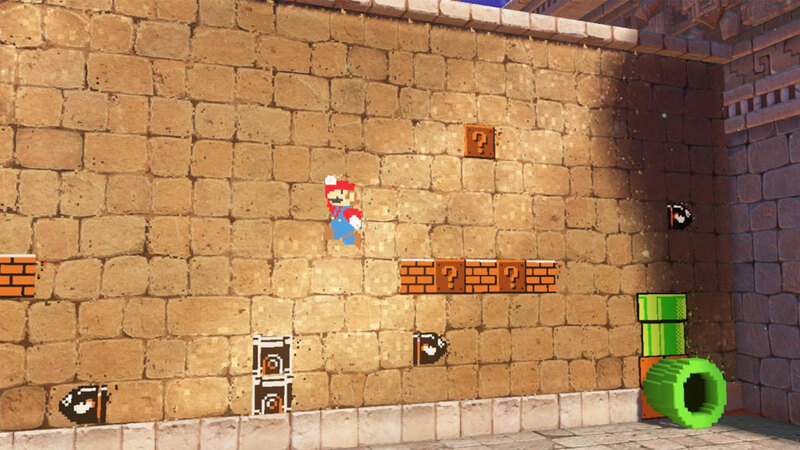 The whole game revolves around the Mario’s mysterious hat, which can be used to take control of enemies. 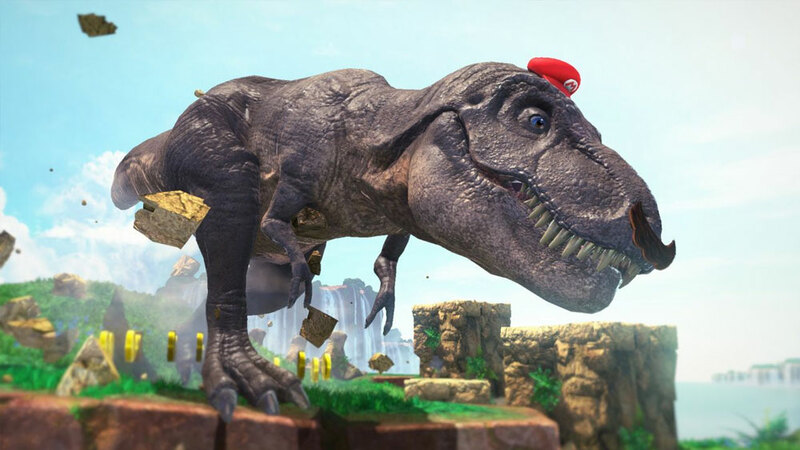 Mario can take control of chain chomps, goombas, and even a giant dinosaur. Some kids may find some of the monsters scary but they often have a humorous twist. For example, when Mario takes control over the dinosaur, the dinosaur has a little mustache. With no real violence, gore, or blood, you have to look really hard to find any objectionable content. All the violence is presented in cartoony form. The only real cartoony violence involves Mario jumping on enemies and throwing his hat at them. In one set piece, Mario will also take control of a tank and fire fireballs at enemies. Additionally, Mario can wear different costumes and there is a costume that allows him to go shirtless. Unless you don’t let your kids play video games, this is a friendly family video game for everyone. Mario games have been a favorite of ours since the NES days with the original Super Mario Bros., so it has been an exciting journey to see how the Mario franchise has evolved many times over the years. 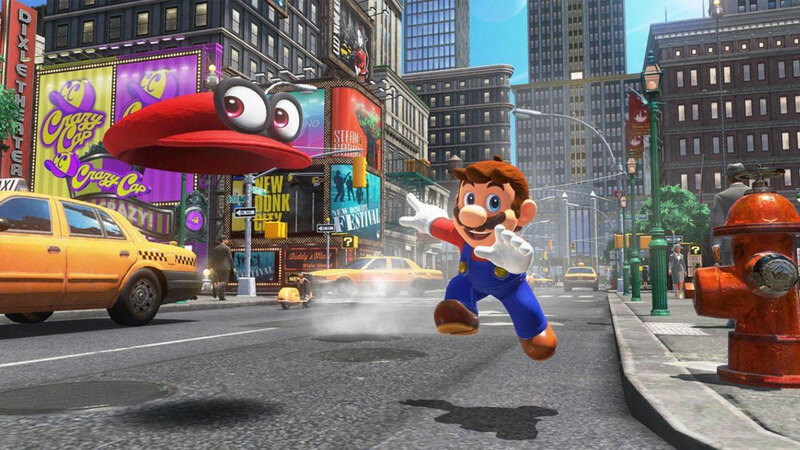 Mario is a video game icon that has continually evolved to satisfy fans in new and exciting ways and Super Mario Odyssey is no different. Super Mario Odyssey showcases that Nintendo is a true master of its craft. It’s the long-awaited true sequel to Super Mario 64, the game that revolutionized the video game industry and 3D gaming. While Odyssey may not be the revolution we had expected – it represents one of Mario’s greatest adventures to date – brimming full of creativity and surprises around every corner. You just can’t help but smile throughout this fantastic adventure that is a pure delight to play. If you love video games at all, this is a must-play experience that gamers of all ages will enjoy because it stands among the greatest video games of all-time. Mario has a new trick up his sleeves – or shall we say atop his head in his latest adventure! 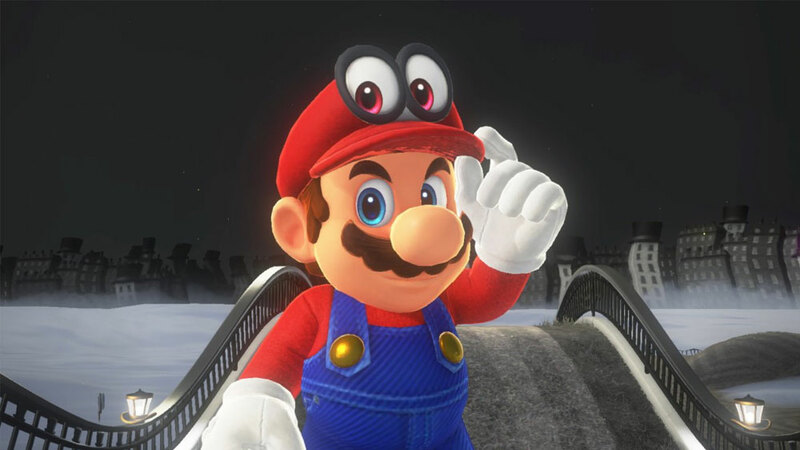 Meet Cappy, Mario’s sentient cap. Cappy is the unique, new gameplay mechanic of Odyssey that adds a whole new twist to the core Mario 64 gameplay. Throw Cappy at various enemies and objects to take control of them. Cappy is the unique, new gameplay mechanic of Odyssey that adds a whole new twist to the core Mario 64 gameplay. Throw Cappy at various enemies and objects to take control of them. It works just like magic! So, for instance, you can throw your cap at a T-Rex and you can become that T-Rex – wrecking anything and everything in your path. It’s an interesting new twist that spices up the core Mario 64 gameplay. Best of all, after playing it for awhile and getting the hang of it, it all feels very natural and not forced like a gimmick. Mario Odyssey begins its enchanting journey with Bowser capturing Princess Peach. 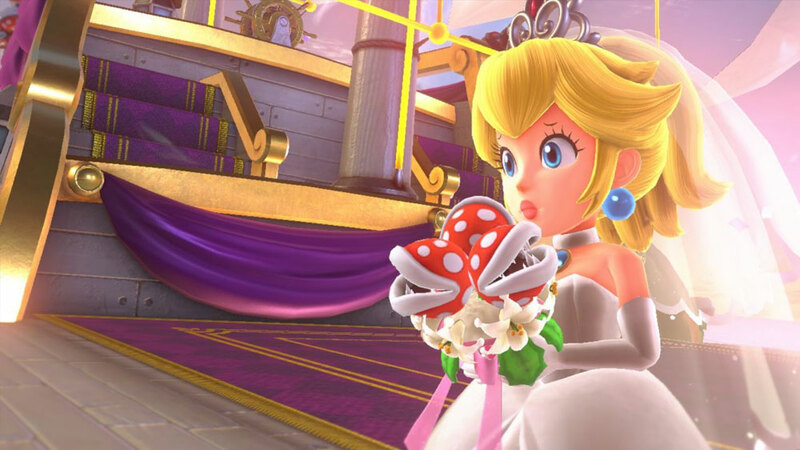 In this latest storyline, Bowser is evidently trying to marry Princess Peach. The game has you collecting power ‘Moons’, which are used to power your ship, the Odyssey. The more Moons you collect, the further you’ll be able to progress in the game. You’ll eventually want to catch up with Bowser and crash his wedding plans in an epic showdown. The first thing you will notice when you boot up Odyssey are the impressive silky-smooth visuals. They are easily some of the best graphics for the Switch – with plenty of visual candy to dazzle the eyes. What’s surprising is that the game looks great in both portable or docked modes. Many are quick to claim the Switch is underpowered, but this game really shines and demonstrates you don’t need to have the most powerful hardware to create a fantastic looking and playing game. Each Kingdom is expansive and different from the next — beautifully well-crafted and encouraging discovery and exploration like Mario 64. The game is just bursting with an abundance of creative ideas and plenty of surprises to keep you entertained all the way through the 50+ hour journey. 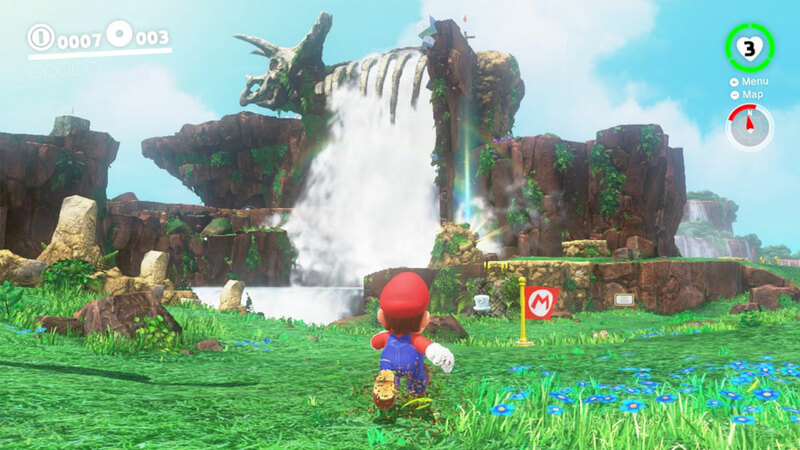 Many fans will be delighted that the game returns to the sandbox-style gameplay made famous by Mario 64. While the game stays true to its Mario 64 roots, it expands on the core gameplay in new unimaginable ways. Super Mario Odyssey is more of an evolution of the series than the revolution we got from Super Mario 64. However, that is not to take away from its brilliant game design, near-perfect refined controls and excellent overall game. It’s Mario’s greatest adventure yet and a master class in game design. Nintendo shows that F-U-N is still at the core of its game design philosophy and it’s wonderful to see that they haven’t lost sight of that very fact. Too many times it seems developers lose sight of the fact that they are making games so people can have fun and be entertained. Nintendo has never lost sight of what makes a game FUN and that explains why they continue to succeed some forty years later. If you’ve played 3D Mario games before, you’ll be accustomed to Mario’s repertoire of moves. In addition to Mario’s familiar maneuvers from Mario 64, there are a handful of cool new moves to master like the hat jump and Sonic-like roll. If you’re a Mario newbie, there is a bit of a learning curve before you can fully master the various moves. Practice makes perfect. Moves like the hat jump and long jump require a bit of practice to consistently perform. Thankfully, there’s also the Action Center that shows you how to perform each move. You really have to master the control set to fully enjoy the experience, so the Action Center is a welcome addition. The good news is that Nintendo really nailed the controls with Super Mario Odyssey. Mario has never controlled better and it sets the benchmark by which all 3D games should be measured. The only shortcoming is the motion controls, which offer less than desirable precision. Mario has never controlled better and it sets the benchmark by which all 3D games should be measured. The only shortcoming is the motion controls, which offer less than desirable precision. Thankfully, they are not used that often in the game and don’t break the overall experience. Also, it’s worth noting that you can perform some of the motion controls without any motion whatsoever. The camera system was in its infancy when Mario 64 was released, but now you have full control over the camera, which is a welcome improvement. The new camera system allows full freedom of movement, allowing you to freely explore the world for all of its hidden secrets without ever getting stuck in a corner. Super Mario Odyssey evolves the core Mario 64 gameplay in many interesting ways. Recall, Super Mario 64 was more about exploration than platforming. It also brought Mario into a fully-realized 3D world for the very first time. Let’s take a closer look at how the new game has evolved. First, there’s Cappy which allows you to take control of enemies and various objects in the game. This takes a little getting used to because it is something new for Mario fans. In fact, it’s the first time the series has taken this direction and honestly it’s pretty cool to take over enemies and various objects. Not only is it cool, but it also adds great variety and extra depth to the core gameplay. You can take over a T-Rex, Goomba, Bullet Bill, a flying character, and so much more! And it’s so much FUN! Second, as a nod to old-school 2D Mario games, the game seamlessly blends 2D platforming with 3D platforming. It’s like old-school meets new school and it just works perfectly. It’s like a match made in heaven. If you’ve never played the classic 2D Mario platformers, it is sure to be a treat. The new worlds called Kingdoms literally feel like giant playgrounds and are designed to encourage freedom to explore and discover all of its hidden secrets. What we love most is that you are now free to explore wherever and however you want. In other words, you no longer progress in a linear fashion. The maps help you navigate your way through these large playgrounds and even allow you to quickly transport to various locations throughout the map. In a rather surprising twist, Odyssey does away with the Game Over screen, so instead of dying you simply lose coins. So be sure to collect those coins. The game offers a decent challenge for veteran players and newcomers alike. With the newly implemented system, it’s not necessarily a walk in the park, as one might think. Series’ veterans should have no problem completing the game. The true challenge will come in completing the game 100%. In Mario 64, after collecting a star, the game would kick players back out to the hub world, which would interrupt your gameplay experience. 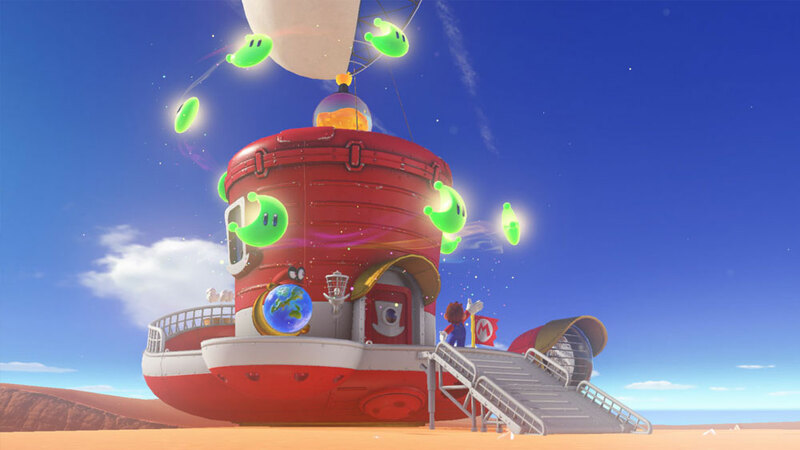 With Odyssey, Nintendo has streamlined this so that once you collect a Moon, you can seamlessly continue onto the next challenge and Moon without interruption. It’s a subtle tweak but this is sure to be a welcome addition for most fans. 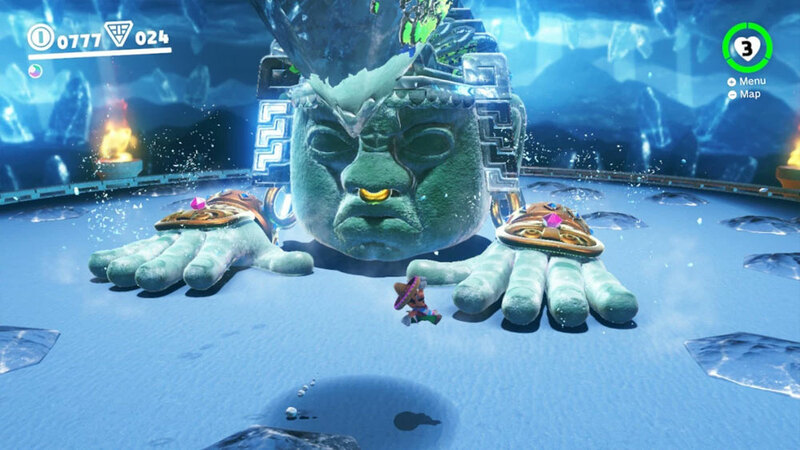 From the brilliant level designs to the numerous challenges to the various ways in which you can utilize Cappy, this game is simply bursting with creativity through and through. There’s no shortage of creativity here. Even the controls have been refined to near-perfection. Mario is a pure joy to control – it’s literally like controlling a remote-controlled version of Mario. From the brilliant level designs to the numerous challenges to the various ways in which you can utilize Cappy, this game is simply bursting with creativity through and through. Revisiting worlds in the game opens up new Moons and challenges and even more are unlocked when you complete the game – adding extra replay value to the game even after you beat it. The bosses are well-designed and varied, each with their own distinct style. None of them feel overly challenging and you never feel like you died from cheap deaths . In fact, most bosses can be defeated in a couple tries and will put your skills to the test. Bowser in Mario 64 was certainly cool the first time we fought him, but they over used him a bit too much. 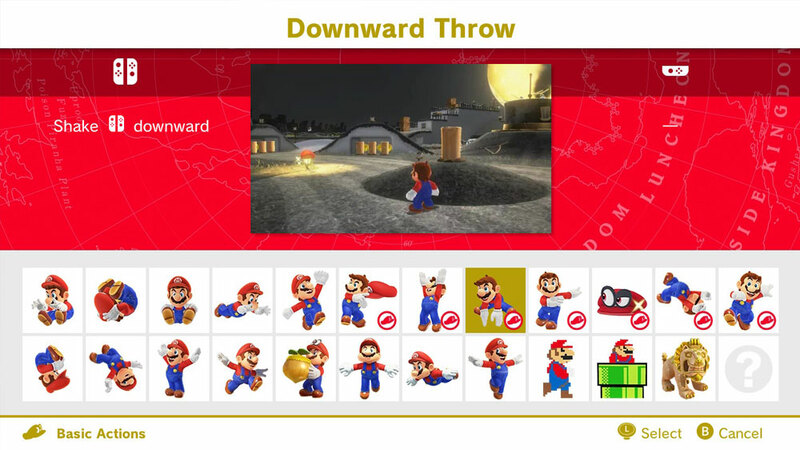 Lastly, unlike Mario 64, you have to actually use most of the diverse move set in the game to advance; this includes moves like back flips, long jumps, hat jumps, and more. They’re not merely there for fun anymore. Stringing the moves together can help you grab a power moon that would usually be beyond your reach. Wa-hooo! 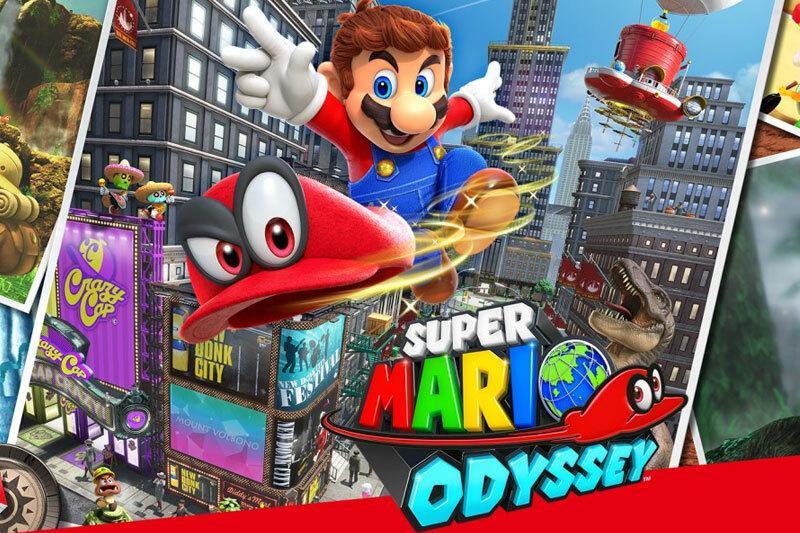 So in Odyssey you have 3D platforming, 2D platforming, capturing enemies and objects, completing various challenges to earn Moons, discovering a plethora of hidden secrets, solving puzzles, exploration, discovery, boss battles, and so much more. There’s just so much to see and do in Super Mario Odyssey and it never seems overwhelming. Every moment is a pure joy to play. With all of these gameplay enhancements, Odyssey manages to outshine its predecessor, Super Mario 64, by leaps and bounds. And that is a pretty big deal considering that was well regarded as one of the best Mario games of all-time. Although Odyssey is a solid AAA title, we feel Odyssey could have been improved in several ways. First, this may be Nintendo at its best, but we feel that Nintendo may have played it a bit safe by sticking too closely to the Mario 64 formula and creating more of an evolution than a revolution. We’re still waiting for the Mario game that blows fans away and creates the next revolution in gaming like Breath of the Wild did for the Zelda franchise. But when a game plays this well, honestly we don’t really care that it’s not revolutionary. If we were in charge of directing Odyssey, we would have eliminated the motion controls. They somewhat spoil what would have otherwise been a perfect 3D control system. If we were in charge of directing Odyssey, we would have eliminated the motion controls altogether because they lack the precision necessary for a 3D Mario game. They somewhat spoil what would have otherwise been a perfect 3D control system. Also, the overall presentation of the game could have certainly benefited from voice-overs for Mario and the cast of characters to create an even more entertaining experience. Maybe in the future the story could be a central focus of the next Mario game that goes beyond the princess getting kidnapped that actually lives up to its gameplay. Kids would be able to better relate with Mario if it played out more like a Saturday morning Disney cartoon with voice acting. After playing through Mario Odyssey, there’s no denying it’s a masterpiece that lives up to Mario’s great legacy. It is one of Nintendo’s finest creations to date and builds on the successful Mario 64 formula while breathing new life into it in clever and imaginative ways. You can’t help but smile while playing Odyssey. It’s a pure delight to play and its addictive gameplay will keep gamers hooked until the very end of the adventure. You can’t help but smile while playing Odyssey. It’s a pure delight to play. Although you don’t have to find every Moon in the game to complete it, true completionists will be eager to complete the game 100%. With 50 hours or more of varied gameplay, it’s really hard to complain when you’re getting such a polished and delightful Mario experience that pushes the Mario franchise forward. When a game can hold your interest for that long without feeling like you’re playing filler – that is a major achievement for the creative wizards at Nintendo and you know you have something special. That is no small feat considering most games from other companies have a ton of filler content and don’t even have half the fun and creativity in their games. You certainly get your money’s worth. While it’s not the revelation we expected, it was the most fun we had with a game all year long. Odyssey is an essential for all Switch owners that no Switch owner should be without.